*not in active design or development, but open to partnerships for future collaboration. Overview: Mapping Arts Project maps cities through places where artists have lived and worked historically. 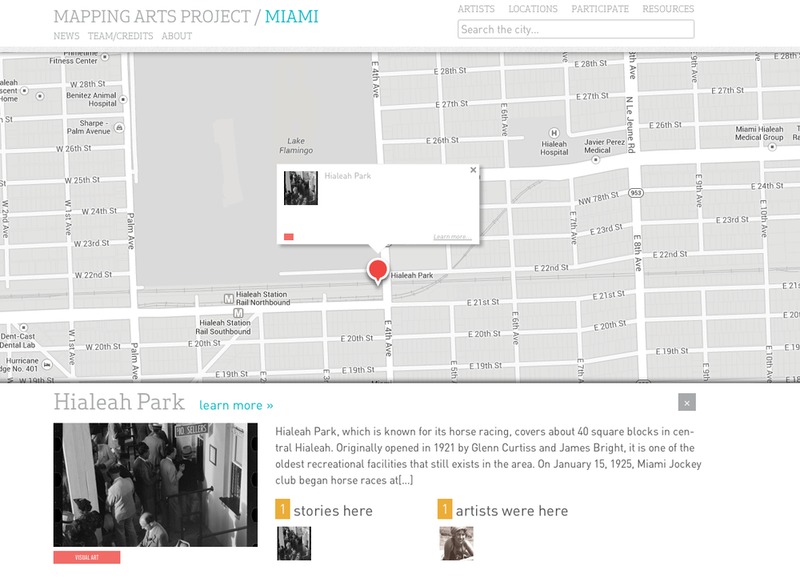 The site features maps, archival and contemporary images, and narratives about the artists and places. The goal is to connect historical narratives of art and arts practices to geographical places in an accessible way. 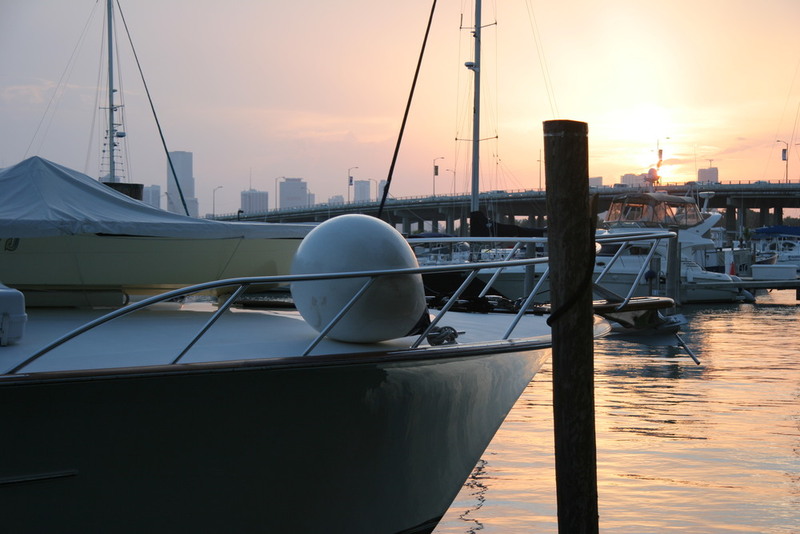 The project currently includes three cities - Miami, Providence, and Denver. 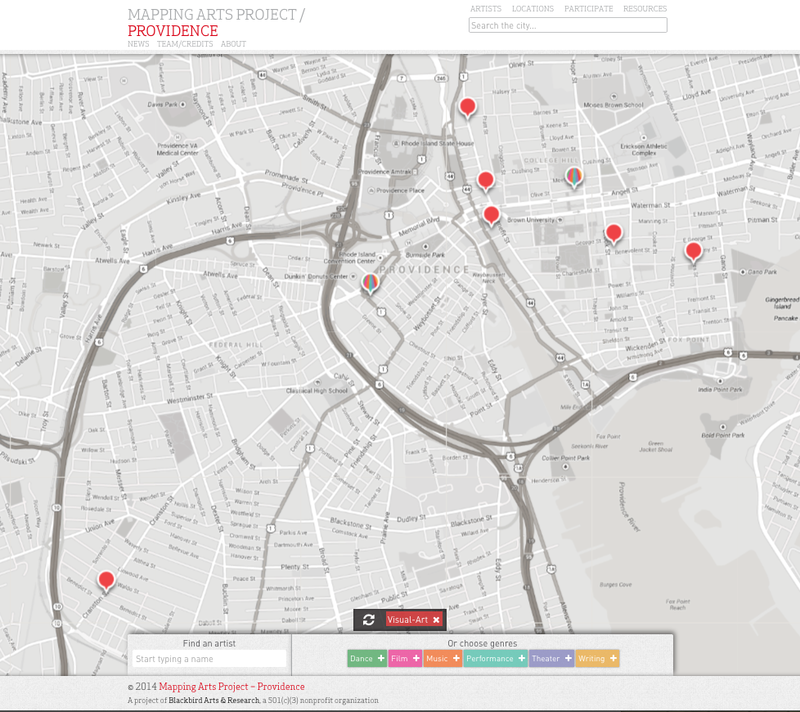 The project takes a unique focus for each location: highlighting an area of the city's hidden histories. In each city, I led a team of researchers and developers from idea to launch. We are open to new collaborations and new cities! Funding & Awards: Miami Dade County Department of Cultural Affairs Community Grants; Denver Arts & Venues' IMAGINE2020 Fund Grant; Front Page Feature in Providence Journal; Brown University's Teaching with Technology Award; University of Colorado President's Fund for the Humanities; Creative Capital Professional Development Workshop Award; and people like you ;) through an crowd-funding campaign. Status: Launched in 2011. Redesign in 2016. As of 2017, not in active design or development, but open to partnerships for future collaboration. In advance of a full redesign, we have implemented some changes based on usability tests that I ran in 2016. I found that most users did not know they could click on the "timeline" boxes to get more information about the artist stories. We needed to implement a visual cue. The visual cue mimics the logo design of a map marker. It is activated on hover or click so that there is more of a signal to the user that they can click. Another change recently added to the site are the Filters. After adding more cities to the project, we needed to build in a system that was more consistent in helping users discover content. Unless a user randomly clicked around or knew exactly what they were looking for, the discoverability of the some of the content was difficult. I reorganized the category structure for places, and working with the development team we implemented the Filter. Now users can select and deselect place categories which will populate and depopulate the map. In this example, first all categories are shown. Then, "school" is selected, and we can see all of the school location types.